We love AR Rahman. What's not to love about the man who gave us glorious melodies in Roja, Bombay, 1942 A Love Story, Dil Se? What's not to love about the man whose own voice is like a pool of dark chocolate? On his 49th birthday, Mumbai group Voctronica dropped a medley of AR Rahman's songs, a capella-style. 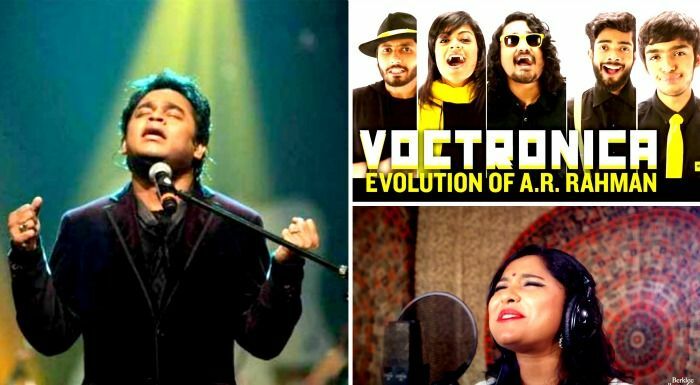 In the 'Evolution of AR Rahman', the group sings some of his most memorable tunes in just under five minutes. Singing songs from Rang De Basanti, Roja, Rangeela, Slumdog Millionnaire, the group - Clyde Rodrigues, Raj Verma, Warsha Easwar, Arjun Nair and Avinash Tewari - have used no instruments. While it's true the originals are glorious, it is also true that when a Rahman song goes a capella, it begins to sound somewhat magical. Like someone just sprinkled it with gold dust. This isn't the first time a group married a capella to Rahman's music. You cannot help but love this version of Jiya Jale from UK's Berklee College of Music. Or this collaboration with Rahman with the music ensemble. As you can see, we love a capella. And we love Rahman. So when we get Rahman and a capella together, it's a little bit like heaven.